Yellow flowers brighten even the gloomiest day in November. And my “Aunty Doris” chrysanthemum is still going strong. I would love to know more about Aunty Doris. I’m searching family archives to find photos of her greenhouse and garden. I’m sure we have a lot in common. We both love growing flowers and arranging them. And I think of her often. When I’m cutting and arranging these flowers, I think about her doing the same – only 40 ago. We would have taken cuttings, grown the plants and watered them. And would both be harvesting them at the same time of the year. I wonder if she loved them as much as I do. 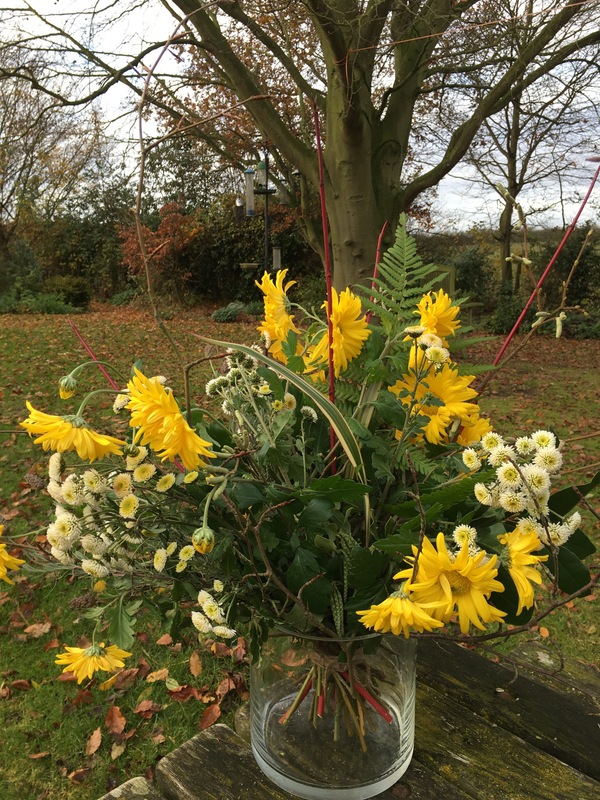 I’ve arranged my yellow chrysanths with dogwood stems, phormium and ferns from the garden. The creamy white button chrysanthemums are called Stallion and are growing through the sweet pea canes in the cut flower patch. These flowers, as always, are for my wonderful MIL Joan. She loves any signs of spring- so I have added tiny hazel catkins. Together with the cheerful yellow chrysanths- they are guaranteed to make her smile. I just wish Doris could see them too. Thanks to Cathy for hosting this meme. Why not go over and see what the others are growing and how they are using flowers from their gardens. Are you growing any plants passed down through the family, as I am? Or do any of your flowers remind you of friends and family? ‘Aunt Doris’ is a real beauty and a real ray of sunshine at the back end of the year. I have plants given to be by friends but not family. It does add greatly to my pleasure in knowing who first grew them. Lovely shapes, textures and colours in your vase today. Really lovely for the last week in November. Blogging always sends me down memory lane. I don’t know why. Your post was very elegiac, I enjoyed reading it very much. Thank you for your very kind comments. This summer, I’ve enjoyed delving into my family archives. The photos are so revealing. My own family were farmers, and I see them with shire horses and hand ploughs. A hard life indeed. My life has been much easier than theirs. And yet they look happy. Family history is such a fascinating subject. I’m pleased I’ve got some time now to study the photos and piece together my past. Beautiful arrangement. The bright yellows are cheery. I’ve been searching through family pictures lately and have found it delightful to come across plants on the porches and hydrangea shrubs and such in these old photos. thank you. And thanks for taking the time to comment. It is much appreciated. 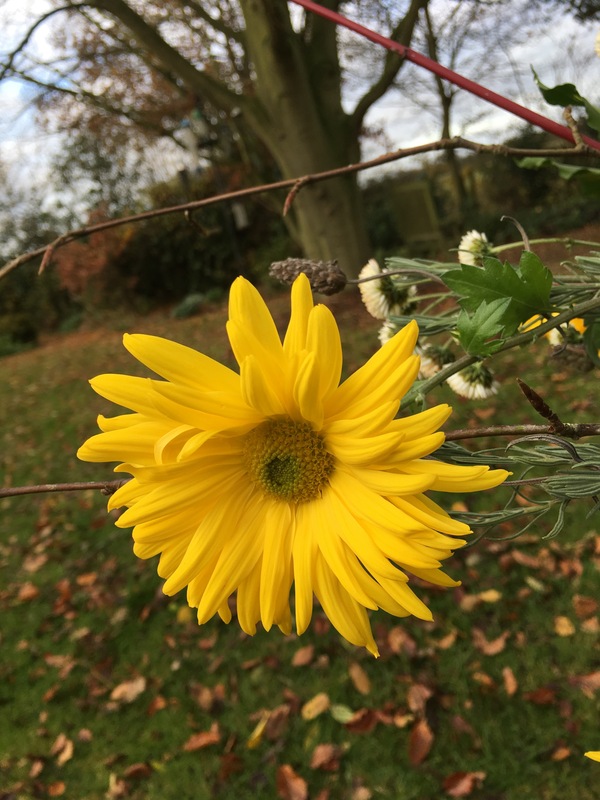 I love yellow flowers at any time of year but they do have extra value in autumn when the days are short. 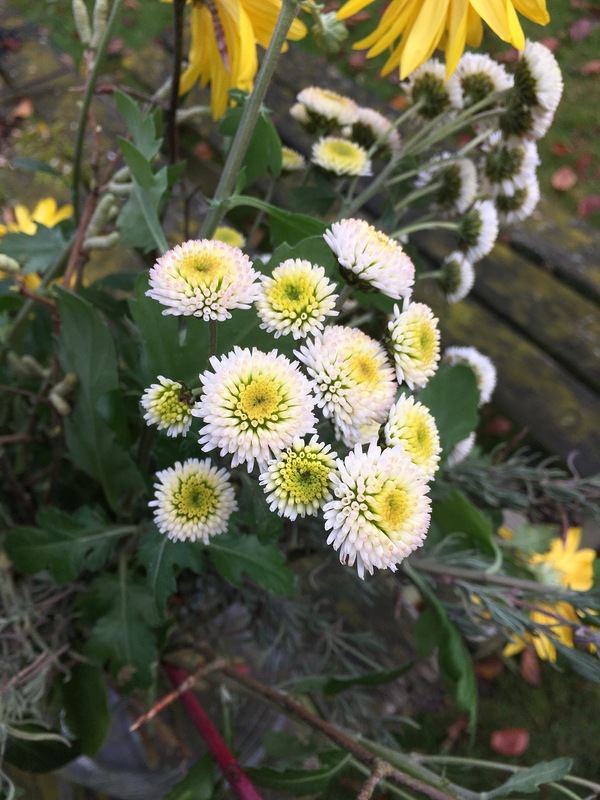 You created a beautiful arrangement that once again has be wondering why I don’t grow mums. 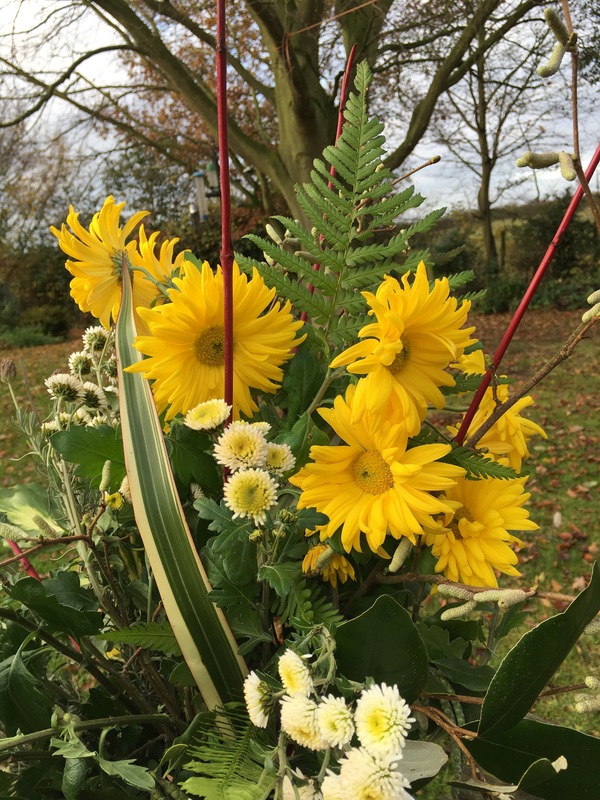 I think it is lovely that you can share these sunny cheerful flowers with Joan and with all us bloggers too! Thanks Karen! I think yellow and white is one of the prettiest color schemes. It’s always so fresh and cheerful. I hope you will share what you discover about Aunty Doris. Thank you Marian. I will. And thanks for your kind comments. 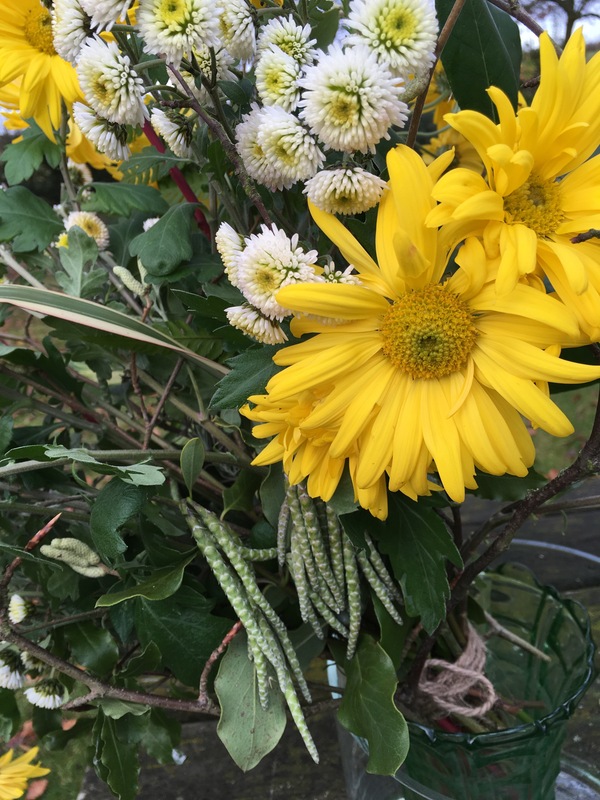 That chrysanthemum is so cheerful, and the dogwood springing out gives the whole vase even more energy. Thank you. We need as much good cheer as we can get. White over here, and minus 5 today. Two pairs of socks day. No gardening.